There’s no doubt that moving can be a life-draining experience under the best of circumstances. Add in kids—and it most certainly does not qualify as “the best of circumstances.” In fact, complete chaos can ensue. 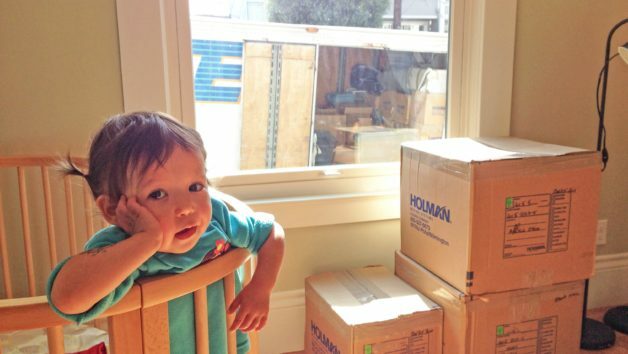 But don’t despair: Here are some tips to minimize the insanity of relocation with little tykes in tow. Kids are insightful little critters, and even the really young ones have likely gathered that something is up. Rather than letting them fret, give them the low-down on the plan as soon as you know you are moving. “Set up a special dinner night with pizza or their favorite food and inform your kids of the move,” recommends Pauly Presley of Presley Realty in Austin, TX. Explaining details—that mom has a new job, that the house will have a room just for them, and that the new town has a great park—will help to allay their concerns. Reassure them that all their familiar items will go with them, and that they will have ample time to say goodbye to friends. If you have younger kids, consider doing the majority of packing while they are with a baby sitter or friend, or at night. Not only are they likely more interested in unpacking boxes, but they also might be upset seeing their things go away, even if it’s only temporarily. Older kids can help fill boxes, and then let them unleash their creativity with stickers and markers. “Allowing them to personalize their box of belongings keeps them busy and also makes it easier for you to identify what goes to their room when you arrive at the new house,” Presley says. Kids will want to set up their new digs as soon as they can. Set aside one box of items you will need ASAP, and take it with you in your own car rather than placing it on the moving truck. Let your children choose the “essentials” in their life and place them in this box. For them, it might be a certain teddy bear or toy. No judgments! This box is all about what your kid will want on hand. That way if the moving truck ends up late or boxes get lost, your kids know they’ve got the things they love most within reach, which curbs the odds of a first-night-in-new-house meltdown. Also keep in your own car a box of any important school-related documents (e.g., birth certificates, medical records, and transcripts) to ensure your kids are prepared for their new school. “It’s easy to misplace papers when moving, so making sure important documents are ready to go will make the move less stressful on the other end,” Presley says. Kids are hoarders by nature, and that can spell trouble when you realize you are paying to move the bottle cap collection or stuffed animal menagerie. “This is a great time to go through their belongings and donate items that have been outgrown or overplayed,” says mom and Realtor® Susan Chaceof Avenue Properties in Seattle. Talk about the fresh start they will have setting up a room sans clutter, and underscore that the donations can help someone else. However, you want to make sure they have bought into the whole “letting go” thing; if they’re overly upset, it might be wise to table the purge. Closure is tough for everyone, but especially for kids, who may be incredibly anxious about whether they’ll find a new BFF or if their new teacher will be as kind as Ms. Jacki. “Have kids take photos of their room, yard, school, friends, and anything else that’s important to them so they can create a memory book of this chapter in their lives,” suggests Chace. You also might want to throw a going-away party to allow for proper goodbyes. If you’re moving out of the region (road trip! ), make the drive part of the excitement. Show them the route you’ll be taking, and highlight areas of interest you’ll see along the way. Try to plan a few fun stops along the way. And don’t forget the souvenirs. “If you’re traveling across many states, collect a magnet from each place you visit and display them on your new refrigerator,” says Chace. Finally, remind them that the most familiar thing they are bringing is still with them: their family. Cheesy we know, but deep down, your kids really do care.